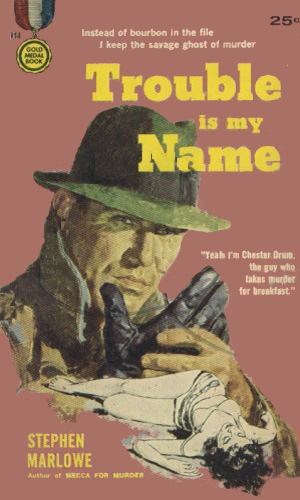 Chester Drum is a private investigator. He works out of Washington, DC. That may be where his office is but his beat is really the world, or at least a good part of it. Very few private eyes of fiction spend more time travelling to interesting places in Europe and the Americas than does Drum. Sometimes he is fighting spies, theirs and ours, and sometimes he works with them. Sometimes his cases are standard fare such as blackmail and bodyguarding and other times it is helping to take down a dictator or free a political prisoner. Drum has a law degree, acquired so he could quit his policeman's job and join the FBI. Having done that for a few years, he quit the Bureau and hung up his shingle in the nation's capital, using many of his contacts for find paying customers. While he at times has an assistant, he keeps his agency a small affair but is now seldom without work and, unlike many other hard-boiled detectives of his time, is not constantly broke and wallowing in booze. Drum definitely makes ends meet, drinks in moderation, usually, and tends to avoid fights when possible. That "when possible" though is not often and Drum's escapades show that trouble seems to naturally follow him. Told in a first-person style, the books give the reader an excellent insight into the character's mind as Drum goes up against very interesting opponents. The plots are fairly standard type detective stories but with an international touch that truly make them special. Drum is not a spy. His adventures, though, would tend to say otherwise. When Chester Drum's ex-wife is killed, her father, a senator, wants to know why. All evidences leads to a connection with a major oil leasing deal the senator's company has with Venezuela and the millions it will bring. The beautiful Fawzia Totah, a former belly-dancer from Jordan, fears she is targeted for death by a wealthy American dynasty because a young man from that family has fallen in love with her. Protecting Totah soon extends to traveling to Mecca during her hadj. 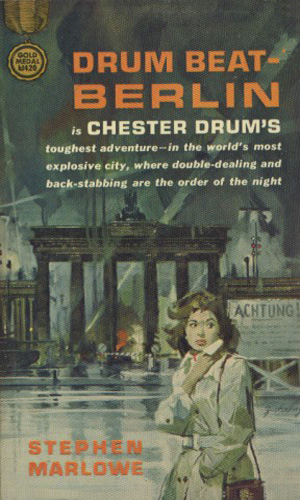 In Berlin to investigate a matter for and possibly about a potential vice presidential candidate, Chester Drum lands between both West and East German interests in a rich German industrialist and his son, a former Nazi. 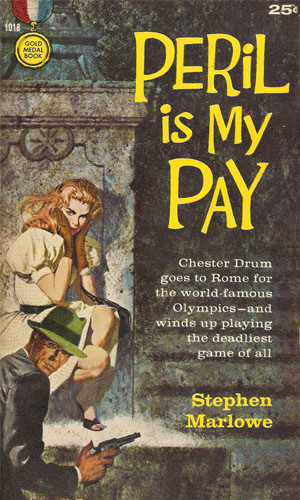 Chester Drum was out for revenge when a good friend, formerly of the CIA and now a civilian working a case for Drum, is murdered in New York, The only clue is a reference to a ship bound for South America. Drum heads there to go against a petty dictator with greater asperations. A fellow private eye whose career had seen better times invites Drum to come in on a divorce case that reeked of blackmail. Drum declines but then the man is murdered in front of him and Drum wants to know who. The case takes him up against a movement in India and those working both sides. Asked to check the movements of a noted law professor, Drum reluctantly took the case only to see the professor kill himelf by leaping from a ledge. Finding out why would take Drum to Canada chasing three criminals, one who thought he was serving his country. The special American envoy to the Emergency Mission at NATO hires Chester Drum to be his bodyguard as he sails on an oceanliner over to Europe. A gangster, once an acquaitance of the diplomat, is also onboard and the envoy fears for his life. Drum soon finds others may want the man dead as well. Driving home from a dinner with friends, Chester Drum nearly hits a teenage girl who runs into the road to flag him down to get help for her companion who is hurt. The simple act of driving them to the nearest hospital lands Drum in a case of deadly blackmail and worse. 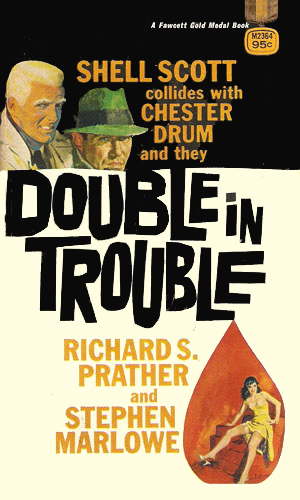 In an interesting combination this adventure starred both Chester Drum and West Coast detective Shell Scott, by Richard S. Prather. Both men in their own way get joked into a frivolous case only to have it turn very serious when blackmail and a US Senator get involved. The client had been arrested for killing an Icelandic diplomat, tried, and acquitted. Then he bragged to a magazine of his guilt for 50 G's and now people from Iceland want him dead. Chester Drum is hired to protect him but doesn't know if he can, or should. When a famous writer is said to have turned down the Nobel Prize while living in Russia, everyone was surprised. Then Chester Drum is hired to not only prove the man did not want to turn it down, he wanted to leave the Soviet Union but was not allowed. Drum travels to Moscow to take on the establishment. A wealthy man's son, a would-be Olympic athlete, is in love with a female Czech athlete and insists on seeing her during the Rome games. Chester Drum is hired to chaperone the young man to keep him from causing a diplomatic incident or worse. An American surgeon was visiting in the volatile nation of Motamar when the revolution erupted around him and he disappears. Chester Drum is hired to find him and get him out but the warlord running that region doesn't like intruders. The wealthy American couple had traveled to the Costa del Sol of Spain for a vacation and ended up staying for fifteen years. Now the husband has disappeared and Chester Drum is hired to follow his trail to learn what happened to him. Axel Spade had made a fortune advising international crooks and smugglers on ways to improve their businesses and legitamize their illegal booty. He is wanted in 26 countries except Switzerland and America. He hires Chester Drum to find out who had managed to steal 3 million dollars from him. 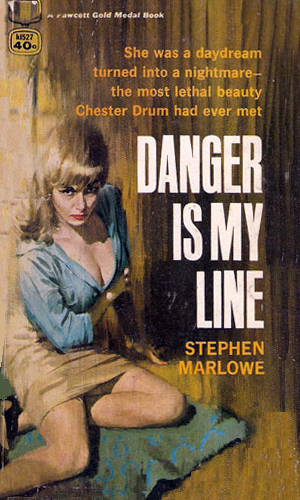 Lorelei doesn't trust Chester Drum because he, like others, thinks her boyfriend is a double agent. She distrusts him even he promises to smuggle her father from East Berlin into the West. Now Drum has to trust she won't kill him or let the East Germans do it. Jack Morley's career had taken a nosedive since he hobnobbed with diplomats in DC. Now he has a low-profile, low-paying government job in Paris. And he has an enemy, a powerful Senator who believes that Morley is blackmailing him. Chester Drum is asked to prove he isn't but how do you prove a negative? Chester Drum accompanies a sometimes friend to Spain where the man was planning to get married. 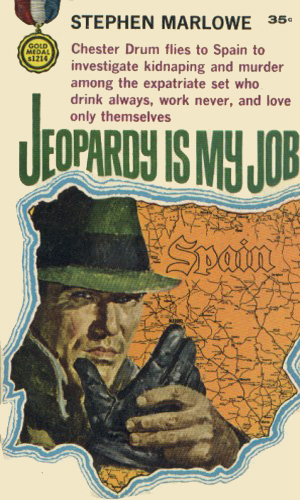 The fact that the man was Axel Spade, wanted in many countries including Spain just made it more interesting. And the fact that they learn about twenty million dollars in missing Spanish gold. A dying movie producer has a last wish to ask of Chester Drum, to find some way to get even with the actor who had stolen and then broken his daughter's heart. Drum reluctantly takes the case, heading back to Europe to at least try to help the daughter and gets involved in very strange dealings with very strange actors. An old friend, Axel Spade, is still lusting over the millions in missing Spanish gold and has a plan to get it. The Russians, though, have plans of their own and want Chester Drum to stop him. 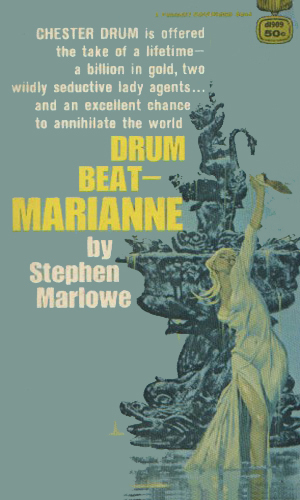 To get him to do it, they kidnap Marianne, the one woman Drum has never stopped loving. 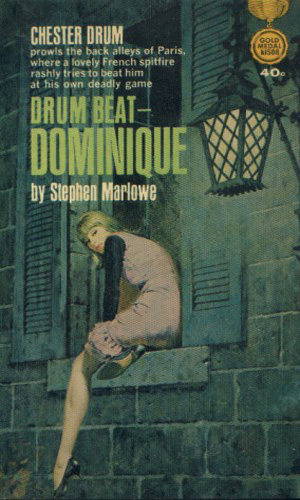 A collection of several short stories published through the years as well as a reprint of the full-length novel Drumbeat: Dominique. 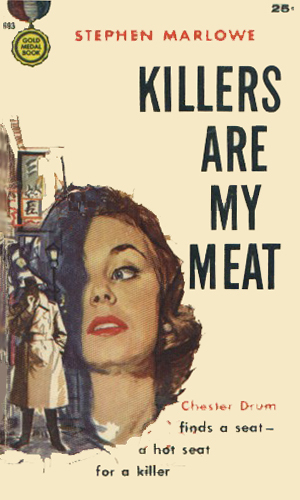 The publication data on these stories comes from the excellent site, Thrilling Detective. 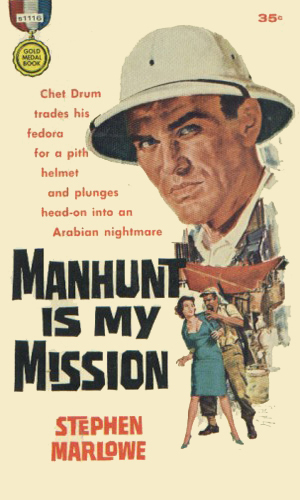 First published in Manhunt in December 1955. 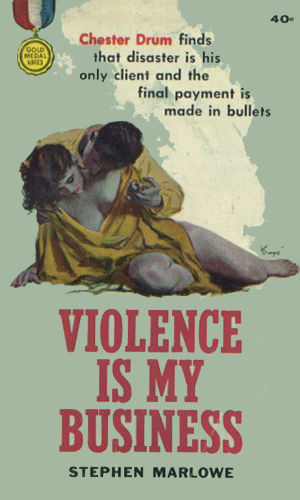 First published in Accused in January 1956 and reprinted in American Pulp in 1997. 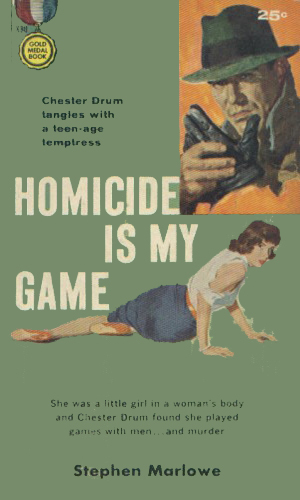 First published in Ed McBain's Mystery Book #2 in 1960. Reprinted in the collection Drum Beat in 2003. 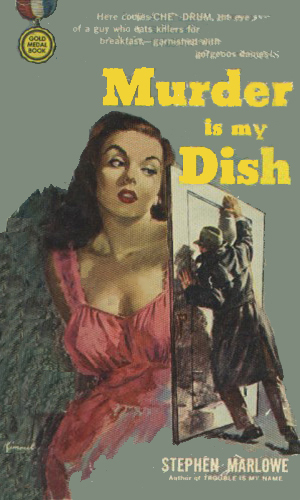 First published in Saturn Web Detective Stories in January 1961. 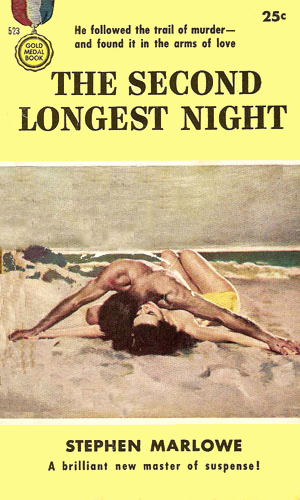 First published in Best Detective Stories of the Year - 1964 edited by Anthony Boucher. Reprinted in the collection Drum Beat in 2003. First published in Come Seven / Come Death. Reprinted in the collection Drum Beat in 2003. 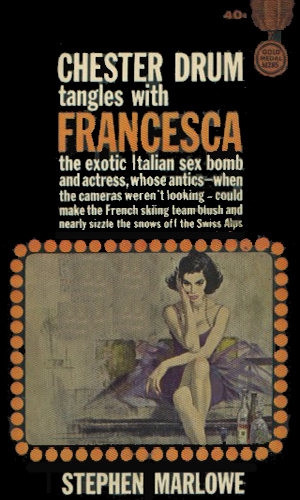 First published in Alfred Hitchcock Mystery Magazine in March 1968. Reprinted in the collection Drum Beat in 2003. 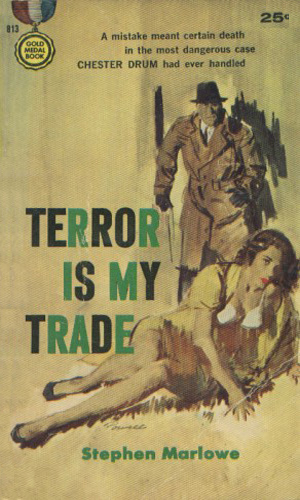 First published in Ellery Queen Mystery Anthology #25 in 1973. Reprinted in the collection Drum Beat in 2003. 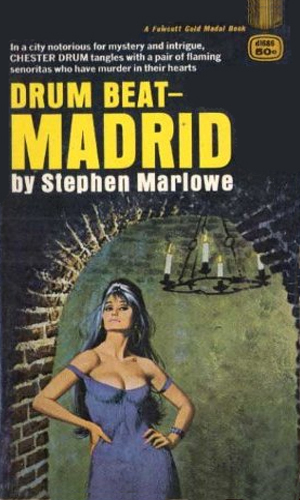 I got to know Drum when he teamed with another detective I really enjoyed reading, Shell Scott. 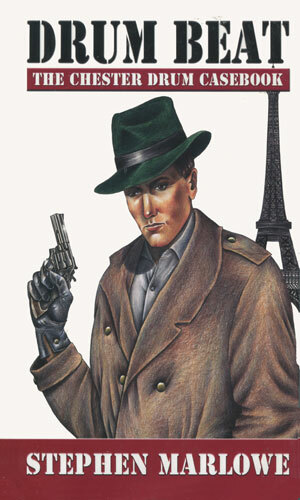 I wasn't as avid a spyfi fan as I am now, wanting to read private eye books more, and I really liked Scott. I wasn't too sure about this interloper, Drum. It would be several years later that I tried him by himself. Then I wished I had done it sooner. I like Drum. I like his style and his adventures and his women. 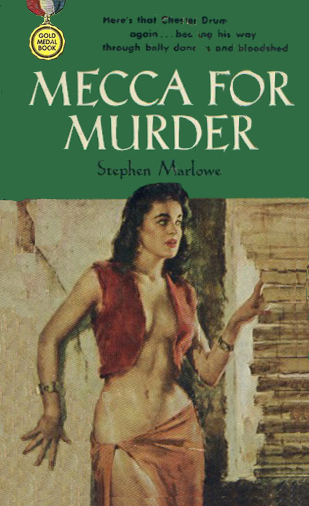 I like the writing that Mr. Marlowe does and the pacing and characters he gives us. 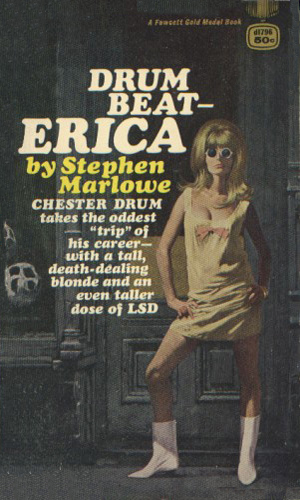 Whether you like spy fiction or detective fiction, I think you'd like Drum. 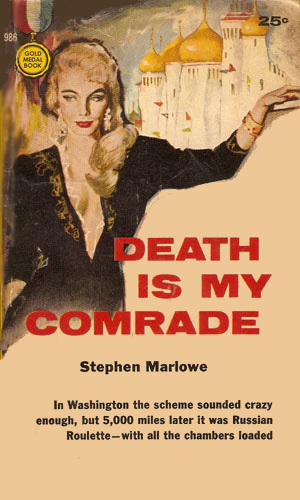 Marlowe, Milton Lesser in real life, also wrote some solid science fiction novels and bestselling spy novels like The Summitt and The Man With No Shadow. He went on to write a number of critically acclaimed novels, win at least one international award, and his The Light At the End of The World was a New York Times notable book of the year.